The upcoming release of the Chinese mainland "Rich List" by the Forbes magazine is perhaps anticlimactic. While the annual list has been highly anticipated in the past, the advent of a rival list compiled by a former "cooperator" has taken away much of the steam from the originator. Zhang Shidong reports. Forbes' decision to drop Rupert Hoogewerf, its former China researcher, has created competition for the US magazine that is renowned for its ranking of the mainland's richest individuals. The Shanghai-based British accountant is increasingly being viewed as a rival to Forbes dominance of the much anticipated annual "rich list." Hoogewerf, who was backed by Forbes to compile the Chinese mainland's richest people lists over the past four years, has now joined with Euromoney Institutional Investor Plc, a UK publisher and conference organizer. His debut list was released on October 16. With its release, Forbes is now running the risk of losing out on the battle for exposure for its rich list this year, a product that has made the company's name famous in the Chinese mainland. Hoogewerf, known as Hu Run in Chinese, and his new partner appear to have gained the upper hand at this stage. When his "2003 Chinamoney 100 List" was made public earlier this month, it gained huge exposure in the domestic media. To raise the stakes, Hoogewerf spruced up this year's ranking by rolling out three innovative separate industrial lists: ranking the top-50 tycoons in the property field, information technology and the capital markets. Hoogewerf admits the idea of the three smaller lists was conceived last year but they failed to materialize because of lack of time. He believed their advent gave him more of an edge in the rivalry. "We have a rival now," said Hoogewerf, who was suddenly dropped by his former employer earlier this year. Forbes, which is now employing its own in-house staff to compile its upcoming rich list, has been left in an unfavorable position as its ranking will be released tomorrow, two weeks behind Euromoney. As Hoogewerf's list has already received the lion's share of media exposure, it remains to be seen how the Forbes list will be received. Some business watchers feel it will have to be eye-popping and innovative to make a splash. "For Forbes, it needs something that is eye-catching. Otherwise, it will not get too much attention from the media," said Joean Zheng, a reporter with the Shanghai Securities News who has covered the Forbes rich list for the past three years. "Anyway, we cannot do the Forbes story in the same manner as we did the Hu Run story." In his Chinamoney 100 list, Hoogewerf underscored the recovery of the information technology industry by putting Ding Lei in top place. The chairman of Nasdaq-listed NetEase.com Inc had his personal wealth listed at US$900 million. Even if Forbes churns out a fresh story in its list, the magazine might still find itself in a position that is comparable and supportive to Hoogewerf's list. It could also make news in how the two sides differ over the calculation of the tycoons' wealth. "It makes more sense to compare the Forbes list with Hu Run's than simply just covering the content of the latecomer," said Chen Jialin, a business reporter of Southern Metropolis Daily, a publication run by Nanfang Daily Group, one of China's biggest newspaper syndicates. However, Russell Flannery, the chief representative of Forbes' Shanghai bureau, said in an early interview that this year's Forbes' China mainland list would give more coverage to IT tycoons due to the sector's surging stock prices. For Forbes, which has launched a Chinese edition of Forbes magazine and recently brought its CEO global conference to Shanghai for the first time, it surely does not want to lose its influence in the Chinese market where it is committed to expanding its foothold. In a fax sent to major Chinese media, Forbes claimed it enjoys more popularity and readership than Euromoney, a highly professional finance magazine targeting institutional investors, corporations and investment banks. The fax said Euromoney had an audited global circulation of 27,064 in the period from July 1, 2001, to June 30, 2002, while Forbes Global had the circulation of 130,000. However, Euromoney shrugged aside concerns of the emerging competition on the grounds that the two targeted different types of readers. "Imitation is the sincerest form of flattery," said Tony Shale, Euromoney Institutional Investor Asian chief executive officer. "But we do not see head-to-head competition. Forbes is a good publication focused on US companies and the economy. We focus on high-end business-to-business financing activities." However, as each seems to be determined to hold a grip on the rich list, the competition in the coming years is inevitable. However, each has its advantages. Hoogwerf already has cozy connections with Chinese entrepreneurs thanks to his experience in China; Forbes is already a well-established brand name globally. "The two lists will co-exist for a period of time until one of them has built up the brand name and gained public recognition," said Xu Po, a research assistant at the case development center of the China Europe International Business School. Initially, Forbes first employed Hoogewerf in a loose form of cooperation in 1999 when he worked for the Shanghai office of Arthur Andersen. At the time, he had conceived the idea of bringing to light the mainland's richest business people. "It was never a long-term cooperation, but a cooperation for three or four months," said Hoogewerf, who broke the ice for the first time on his relationship with his former partner. "That caused trouble to the stability of my team. "Forbes decided every year on whether to use my list. Each year I gave the list to them and they said okay and then got it published," he said. "But they suddenly said no to me this year. Surely, there was some reason for that." Both Hoogewerf and the Forbes magazine did not specify. At the Forbes global CEO conference held last month in Shanghai, Steve Forbes, the magazine's chief executive officer and editor-in-chief, bypassed a question raised by a reporter for his comments on Hoogewerf and the lists he compiled. Media reports said Hoogewerf courted trouble when he published a series of books capitalizing on the Forbes brand name, something which eventually led to their breakup. However, Hoogewerf never stole the idea of the mainland rich list from Forbes. He was the first to take up the whim of doing the job, then giving it to Forbes and several media for publications. "I was never on the payroll of Forbes. They only provided funds for my research and study in China," he said. Even today, Hoogewerf remains independent. He is not an employee of Euromoney either. However, unlike Forbes, his new collaborator is committed to funding his work over the long term. "We have handcuffs and shackles for him if he wants to escape," said Shale of Euromoney jokingly. "There will be a rich list every year," Hoogewerf added. He said the Chinese tycoons have already been increasingly more responsive in their attitude toward the exposure of their wealth than they were when he first started the work. "There was even one person who e-mailed me, asking to be listed this year," Hoogewerf said. "Lots of people said they did not want to see their name on the list. But they would be unhappy about that if they were really not listed." 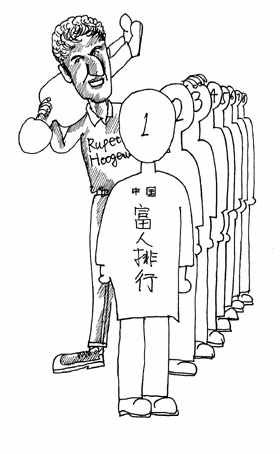 Hoogewerf has now begun a new business model for his four employees and himself in registering as a company in Hong Kong. Using the name ACRU International, he is going to build the company into a research institute focused on China's private sector. He said he will also use this vehicle to publish books and organize a conference to make the business profitable.